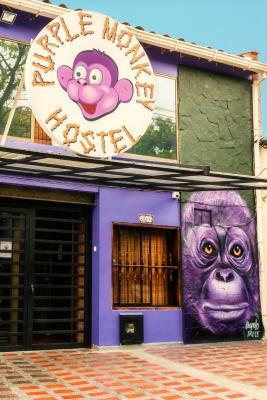 Lock in a great price for Purple Monkey Hostel – rated 8.8 by recent guests! Great atmosphere. Wonderful staff. HOT water. 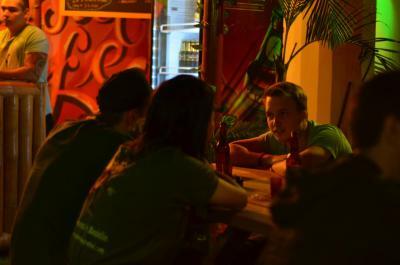 The hostel is about a 8 min walk to the metro which will take you anywhere you need in Medellin. Groceries store close by. Breakfast was basic; toast, eggs, fruit and coffee. I really enjoyed that they had a no noise after midnight rule. Great place to stay. I highly recommend. The breakfast was good, even though you make it yourself. The staff were so friendly and helpful with anything. The crowd the hostel draws is great as well. One of the few hostels that seemed at capacity during low season. I met amazing people and didn’t want to leave. The bar crawl is good as well. 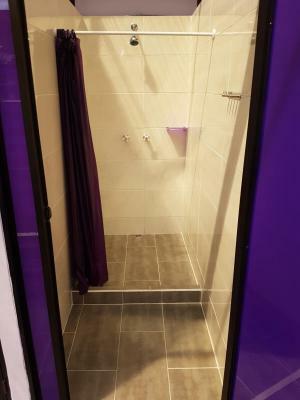 Also, the showers were amazing. One of the best I’ve seen. This hostel was one of the best ones I stayed at. 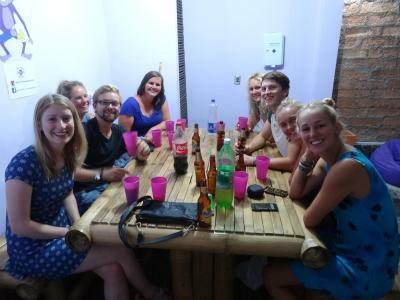 The hostel is super sociable and it’s really easy to meet people which is great. Hostel has good breakfast which you make yourself and has really good food and tour recommendations. The showers were hot with great pressure! Mark, the owner, was very knowledgeable on medellin and the tours around town, and was able to tell us how to get places like Guatape with ease. Wifi signal was strong enough, but Colombia isn't necessarily known for it's wifi, is it? --I liked the front desk guy. He has a great personality and was very friendly. He was more than helpful with all requests and seem to really enjoy his job and take pride in his work. --The hostel appeared clean so that's a good thing!! Love the showers!!! and the fact that each bed had plug for charge phones and own lamp... 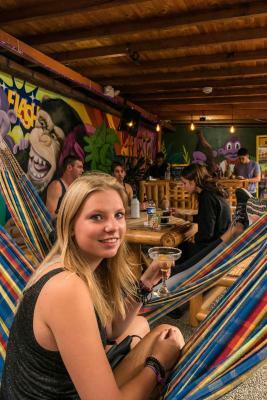 The social areas were excellent and also the hostel is Close to a big grocery store. Efficent loundy service! Good diy-breakfast, coffee available also during the day. Lots of good showers with hot water. Warm welcome even when checking in during the night. Walkable distance from metro station. 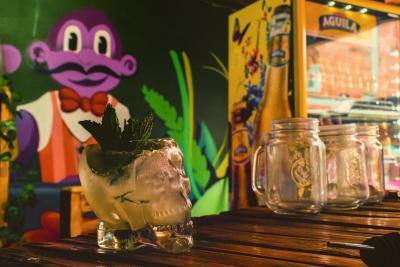 One of our best sellers in Medellín! 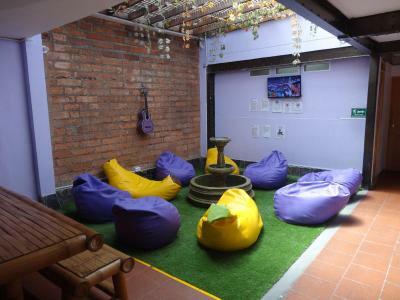 Purple Monkey Hostel has accommodations in Medellín near El Poblado Park and Lleras Park. 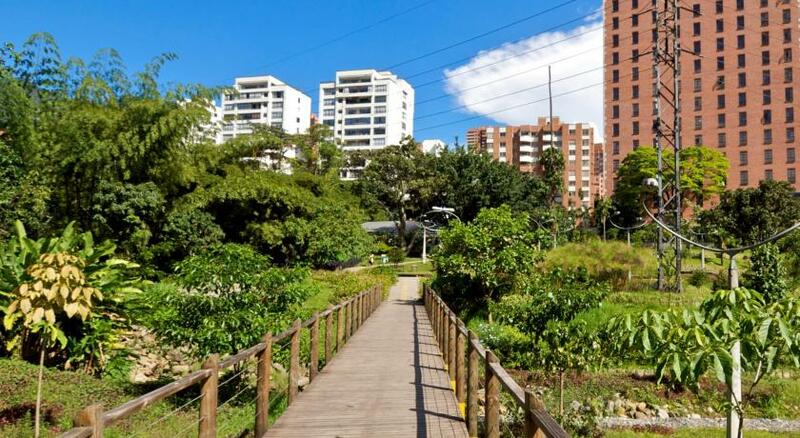 This property is located a short distance from attractions such as Linear Park President, The Dancer's Park, and Medellin's Museum of Modern Art. The tour desk is available to assist guests in planning their days out. Guest rooms in the hostel are equipped with a coffee machine. Certain rooms have a kitchen with a microwave and a toaster. The rooms will provide guests with a fridge. Guests at Purple Monkey Hostel can enjoy a buffet breakfast. 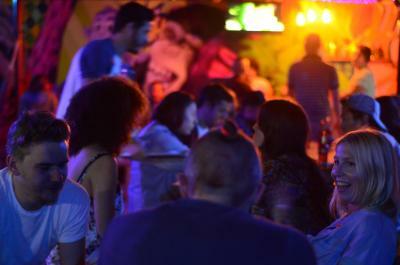 Pueblito Paisa is 3 miles from Purple Monkey Hostel. 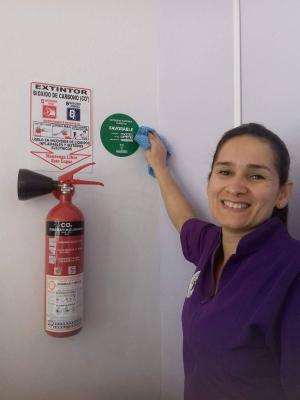 The nearest airport is Olaya Herrera Airport, 1.3 miles from the hostel. 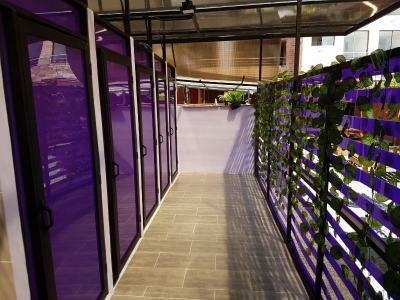 When would you like to stay at Purple Monkey Hostel? 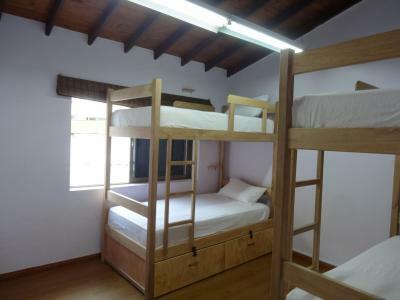 This dormitory room is fitted with oak bunk beds, a safe and private plug sockets. Shared bathroom facilities are provided. 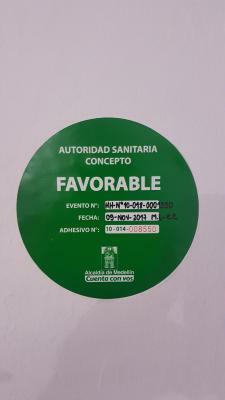 Public parking is available on site (reservation is not needed) and costs COP 2000 per hour. This dormitory room is fitted with oak bunk beds, a safe and private plug sockets. Private bathroom facilities are provided. 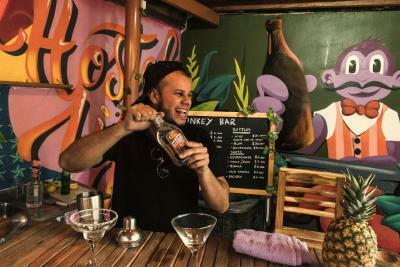 House Rules Purple Monkey Hostel takes special requests – add in the next step! Purple Monkey Hostel accepts these cards and reserves the right to temporarily hold an amount prior to arrival. Please inform Purple Monkey Hostel of your expected arrival time in advance. You can use the Special Requests box when booking, or contact the property directly using the contact details in your confirmation. 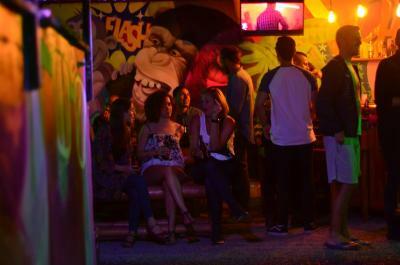 Definately a party hostel, good to keep in mind if that is not what you are after. The staff were really grumpy and didn't seem to want to offer any advice. They would just stare at me when I came to the desk, not even giving a greeting. My bedding smelt really funky too. They let me cancel my next two nights without charge. There was a big massive steal beam above my bunk bed. Smacked me face a couple times. The 10 bed dorm is a little cramped and can get quite stuffy. Nice hostel with great rooftop bar. Easy to meet people and quite social. I don't think there's much room for improvements. Great job purple monkey. Everything! Location was perfect, the staff were always helpful and friendly, rooftop bar great for meeting people, the breakfast was decent. And it was so clean, I think they cleaned it 24/7, and laundry service was quick and really good too! Thank you to all at Purple Monkey! We arrived early and sat around waiting for our room. The front desk guy didn't come to get us when the room was ready, instead made us wait until 2pm on the dot. He didn't show us around or tell us about any services the hostel offers (resulted in us taking laundry next door). Also the dorm room was boiling- fans hardly did anything. Shout out to the guy working the bar on the night of the 30/12 (sorry I've forgotten your name)!! Kitchen, pina water and DIY breakfast was awesome! Room (6 person dorm) was really hot despite fan running all night. Self make it breakfast is a great option. Possibly to socialize in common area downstairs or bar upstairs. Location seems quite safe and is close to metro. Great hostel. DIY breakfast, cool rooftop, cheap bar and good rooms! Used the place as a vantage point in Medellin, and explored the region from there. Everyone was friendly, the rooftop bar was great for meeting new people and the dorms were decent sized and had great storage. 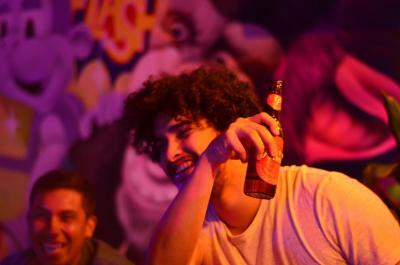 The Thursday night bar crawl that the hostel organises is deadly but most definitely worth it!